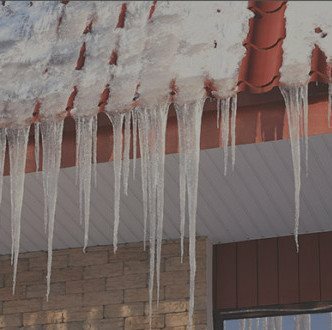 Help prevent roof damage by keeping gutters and downspouts flowing even in frigid below zero temperatures. The package contains shingle clips and cable spacers, along with complete installation instructions. Q: How do I install my Roof Cables? Be sure to check back with the Frost King blog for tips on how to take good care of your home. For more timely advice, bookmark this blog, like us on Facebook and follow us on Twitter. Frost King has everything you need to protect your rooftop from sub-zero weather. Find our products at these home improvement retailers. If you have questions about installing and using any of our DIY home improvement products, contact us, view our FAQs or call 1-800-299-5700. Q: Can I use a roof cable kit on the pipes in my basement? No, you should use each product as per the instructions. The Roof Cable Kit is made for roofs only. For pipe application, you will need a Heat Cable Kit. Q: Do I need to have the Roof Cable Kit plugged in all the time? Or just when it gets cold? The Best Practice is to plug the Cable Kit in, before the snow begins. You can then leave the cables powered on until the snow has melted from the roof. Once the temperatures rise above freezing, you can go ahead and unplug the cables. Q: When the cables are working - should they be warm to the touch? When working properly, the heat cables are supposed to be warm - not hot. You should also be aware of the outside temperature when testing the cables, the cables will only heat up if the temperature is lower than 38 degrees (Fahrenheit). Plus, there is a little red light on the plug which will show you that power is on. Q: How long of a cable kit do I need? Measure the length of your gutters, specifically the amount you need to cover. Plus take note the lengths of overhangs and downspouts. Add these measurements together, and you'll know the length needed to purchase Frost King's Automatic Electric Roof Cable Kit. If you still have a Frost King product concern, contact us. It's all explained in the instructions (click here). Q: Can I get instructions for the Automatic Electric Roof Cable Kit? Yes. Download complete instructions for Frost King's Automatic Electric Roof Cable Kit or visit our blog for a video on how to install our roof cable kits. If you still have a specific installation question or feedback, contact us. Q: Can The Roof De-Icing Cable Kit lay directly in my gutters? Q: How many linear feet would 60 feet of Roof cable Provide? When Installing the Roof Cable Kits on your roof edge using the "WWWW" pattern, a good rule of thumb is, for every 20 feet (including the downspout) of roof you plan to cover, you will need approximately 80 feet of Roof Cable. Ultimately though, it depends on the given overhang and other parts of the roof that needs to be protected. Take a look at the instruction manual for more information. Q: How much Roof Cable do I need for 40 foot gutters? If you plan on running the cable down the downspouts, you could use either the 160 ft or 200ft Roof Cable Kits. Q: Can I attach the Roof De-Icing Kit to my metal roof? Sorry, but the the Frost King Roof De-Icing Cable Kit isn't made for metal roofs, only roofs with shingles. Q: What is the wattage per foot on the Roof de-icing Kit? All the Frost King Roof De-Icing Cable Kits (30 feet through 200 feet) carry a rating of 120V, 5 Watts per foot. How to Install the Frost King Electric Roof Cable Kit. You couldn’t find the answer you are looking for.